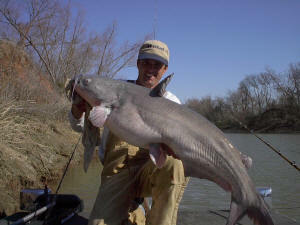 I have always had a fascination with catching big trophy catfish. There are probably more myths and legends about giant c atfish than there are about “Bigfoot”. Every fisherman has heard tales about giant catfish, but I will leave the myths, legends and other assorted fairy tales to the more talented writers and focus on what works for me when it comes to the real world of consistently catching large Blue Catfish on rod and reel. First, I concentrate only on rivers for big cats because it is much easier to locate big fish. 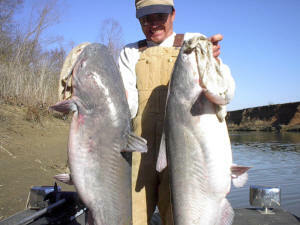 Second, equipment is crucial — cheap, wimpy fishing rigs can’t land big catfish. Rods should be 7 to 8 foot in length, medium to heavy action and rated for 25 to 30 lb line. Reels should be sturdy and hold plenty of heavy test line. I personally prefer the Abu Garcia 6500 and 7000 series reels, but any strong reel will work Fishing river cover and currents demands strong line. As a minimum I recommend a line in the 20 to 30 lb class. When I say cover I am talking about rocks, roots, stumps, old kitchen appliances, or anything else in the river that you might hang up on. I do not recommend line heavier than 30 lb test and this is why: Frequently you need to hold a bait in a spot or hole and the larger the line the more the current drags on it. You can compensate with additional sinker weight, but too much sinker weight and ou negatively impact the catfish bite. 2 to 4 oz of weight should be ample for the vast majority of applications. Swivels should be 2/0 Berkley McMahon or a good quality crane swivels. Don’t use cheap barrel swivels. I use large heavy duty treble hooks but if you hang up too much regular hooks work fine. I prefer the heavy duty Mustad treble hooks (#3566 or #3553) in size #1. Third, rigging is critical. 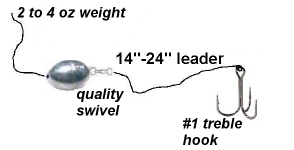 I use a 24″ leader, Trilene or Palomar knots and a slip sinker. 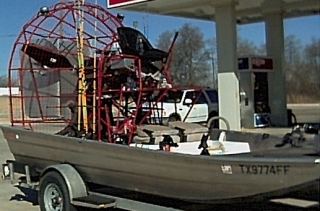 See the picture below, this is basically a Carolina rig. Fourth, big bait catches big fish! Not just any bait will perform properly. Use large fresh shad. Big gizzard shad (8 to 20 inches) are perfect and will usually keep on ice for 3 to 4 days. I strongly believe that fresh large bait is one of the most important keys to my consistency and success. The best rule to remember when selecting, storing and handling bait is to treat it like it was to be your next meal. This means keeping it as fresh as possible. Fifth, Navigating most rivers requires special equipment. The standard propeller may only reach into the water 1 to 1 1/2 feet, but it’s just far enough to find “hard” trash capable of destroying the lower unit on most outboards. My first choice is an Airboat. Finally, Fish the holes where the big cats hang out. Fish anywhere where you can’t see the bottom and keep moving. Don’t stay anywhere longer than 20 minutes unless you really have confidence in the hole. There are some signs above the water line that usually indicate a good place to fish. Look for rocks and high bluffs. These can be indicators of a deep hole. Also look for places where the river gets narrow or makes a sharp bend. Look for any timber laying in water that is too deep for you to see bottom and anchor upstream from it and throw bait on either side and right in front of the timber. When you set up on one of these holes you need to get your boat anchored solid so the wind and current won’t move you around. Fish with as many rods as you can handle but don’t over do it because when you get a big cat on you will have to clear the other lines out of the way. Use good strong rod holders and check the drag setting on all reels as you put them out just to make sure they are not stuck or to tight.